This simple, stylish, easy to read, retro-styled wall clock will work with almost any décor. 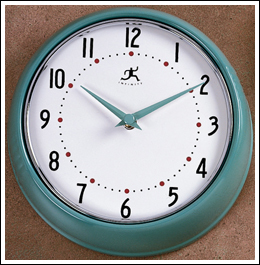 The 9” diameter green clock (enameled metal) has a cream color face with green hands (also available in red). It’s definitely RETRO time!! Uses 2 AA batteries.